An action packed YA fantasy novel, Young’s standalone viking inspired novel is a page turner with a number of twists and turns. 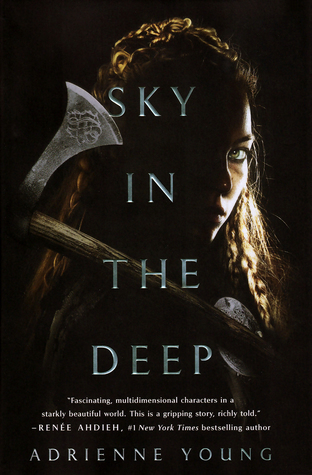 Though in a fantasy setting, Young ties in an abundance of lessons for all readers to learn; from acceptance to forgiveness, Sky in the Deep is an inspirational novel that paves the way to a new outlook on fantasy literature. A lush, Viking-age inspired fantasy about loyalty, forgiveness, and the definition of family. As part of the “Fight Like A Girl” OwlCrate box, this book did NOT disappoint! I was NOT expecting to enjoy this book as much as I did. It’s been a long time since I felt this uncontrollable urge and desire to finish a novel and disregard all my other responsibilities in life. Young captivates readers through her beautifully descriptive language and intensity throughout the story. There are some rather “graphic” sections beyond the fighting scenes, such as sexual assault. However, these sections were not tactless but rather delicate…in the best way possible for those kinds of topics. Young’s book is literally PAINFUL to put down…even though you don’t want to rush it since you don’t want it to end. The amount of depth to Young’s characters is truly spectacular. Recall the last time you read a book and truly forgot it was a novel…that the characters are CHARACTERS…when that line between fiction and reality becomes blurred…THAT is the feeling you feel with these characters. Eelyn wasn’t just a fictional character in a book; she felt like this real person that I personally knew and felt for. I felt like this with a large number of the characters, such as her brother Iri and much more. Young’s characters are constantly growing in this novel, showing an incredible amount of both talents and flaws. Each individual has some struggle or trial they’re trying to overcome throughout the story, whether that be trust or forgiveness or open-mindedness. What’s even better is you feel some sort of closure for the characters near the end; not that “happily ever after” unrealistic shenanigans, but the realistic “it’s not perfect but it’s so much better than before” shenanigans. Story Driven? Character Driven? Why not have a bit of both! As I read Sky in the Deep, I never felt as though one overtook the other. There’s a GREAT deal that focuses on character growth, especially Eelyn and her need to forgive, trust, and let go. On the other hand, there’s a great presence to story development, focusing on the lives of the two clans and the trials each faces. It’s this constant overlapping that allows Young’s story to flow so smoothly, you don’t realize you’ve almost finished the novel. You don’t require a large imagination to image the landscape, characters, and events occurring in Young’s novel…she paints the image FOR YOU. From small details regarding scars and hair pieces to epic and bloody battle scenes, Young creates a film in your mind simply through the use of “words”. Though I tend to “scan” overly descriptive novels, I NEVER did as I read Sky in the Deep…not once! She has an unbelievable gift to perfectly describe a setting or scene or person “just” enough without overdoing it…thank goodness! Adrienne Young has commented on her research towards Viking history for her novel, and it truly shows as you read through it. Her attention to “… clothing, landscape, buildings, weapons, food, etc.” is remarkable, beautifully and accurately depicting the viking visage throughout the novel. Though the concept of the gods and the traditions are rather different, it gives Young’s novel that extra “something” to make it special and stand out brighter than a large number of YA fantasy novels presently and in the past. The battle between clans, the impending doom of a greater foe, the heartache and confusion with faith, the five years wars…Young’s own ideas intertwined with the Viking elements is truly authentic and original. If Eelyn were real, I’d want to be her best friend. Young made sure to give Eelyn both a number of great qualities and flaws. Eelyn is a skilled fighter with amazing attention to detail on the battlefield; even though she can grow nervous, she remains calm and focuses on the NOW. There’s FIRE in her spirit, which is commented on a number of times in the story. Eelyn does have a hard time with forgiveness, which is her biggest challenge in the story. What’s wonderful is that she’s FULLY aware of this and doesn’t pretend to be this “perfect” individual. Though the content is incredible, there are a few sections that felt a little rushed. In the synopsis, there’s talk about a “feud” to mend or everyone will be slaughtered by this thought to be mythical clan. THIS part was not long enough whatsoever. A large portion of the novel focuses on Eelyn’s captivity in the opposing clan. I thoroughly enjoyed this section and would not make it any short; however, the need to stop the feud and fight a new foe didn’t really appear until beyond the half mark of the novel. I was anticipating more “tension” and “battles”, both between the two clans and among the new enemy. Young’s novel could’ve easily been more than 500 pages long and still been a page turner read while focusing more on this “strive to get along and fight the bad guys” part of the plot. Young’s Sky in the Deep has become one of my favourite reads of 2018. Full of epic and bloody battles with an intense amount of emotional growth, Young provides a great number of themes in her novel for all readers to enjoy. Though I felt some parts were “rushed”, a large part of this was simply my desire to have MORE from this fantastical story. If you’re looking for a viking based story with a great amount of story and character driven elements…AND a strong female lead…Young’s novel may be for you. Great review! Honestly between the summary and the pacing, I spent a good portion of the book thinking that this was the first book for a duology…and I totally would have been fine with that. Still, I really enjoyed this book and I look forward to seeing what Adrienne Young comes up with in the future. I thought the same thing!! The ending was a little too rushed, but it was fantastic!! I believe the next book she’s writing is a spin off…so I’m excited to see where that goes with the storyline! Great review! This one is on my TBR as well (I got the Fight Like a Girl Owlcrate box as well). I can’t wait to get into it! Ooooo!! I cant wait to read what you thought of it!! It was a really enjoyable read…theres definitely more room for improvement, especially now that I’ve sat and let it sink in…but it’s still fantastic!! Oh and thank you for the compliment!